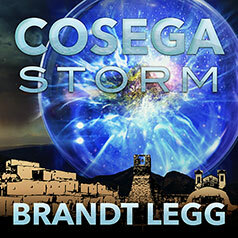 Bestselling author Brandt Legg presents the second installment of the Cosega Sequence series. Cosega Storm continues from the frightening final seconds of the first book in the Cosega Sequence series. Gaines and Asher, caught in a storm of deceit, corruption, and power, desperately struggle to escape—but running isn't enough. They must piece together the mystery of Clastier's life, understand the incredible artifacts, and somehow discover what links them all together. What really happened in the past, and how will it change the future? As each extraordinary secret of the Eysen is revealed, the danger escalates. The more Gaines learns, the less he knows who he can trust. But his most difficult challenge is the paradox of the Cosega Sequence. Failing to decode it in time will cost him his life, yet succeeding also means that he must die.